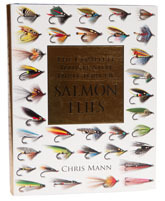 Chris Mann is well known now for his illustrated books on salmon flies, including Shrimp & Spey Flies for Salmon; Hairwing & Tube Flies for Salmon; and Featherwing and Hackle Flies for Salmon. The originally idea behind this new 468 pager was to combine all three previous works into one convenient source, but almost by definition, the previous titles had left some areas uncovered and a decision was taken to include flies belonging to these categories; which means that the Complete Illustrated Dictionary contains 500 new flies. These are mainly in the dry fly/waking fly category, but the flies from page 306 onwards are steelhead flies, included on the grounds that there is a good deal of cross-over between these and salmon flies. As usual, the illustrations are computer graphics, rather than photographs, but I can’t think of many other books that illustrate 1800 patterns and as Chris very rightly points out, tying flies to specifically to photograph for the project would have put it beyond most reader’s pockets. Do note that the emphasis is on patterns that are in use today, so although there are some historic flies, they are definitely in the minority and this is a reference work for modern salmon fishermen, not historians.